Effie "C" Calavaza, a Zuni artist from New Mexico, is one of the most collected and most beloved Native American artists. But she is also one of the bravest. Effie went all the way to the Supreme Court of the United States of America to obtain full copyright of her art work to stop those from importing fake pieces of her work. 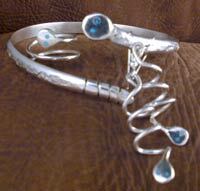 She specializes in sand casting and incorporates large stones with her snake designs. She began silver smithing in 1956 after learning from her husband, Juan Calavaza. Her work is stamped EFFIE C. ZUNI which is the family hallmark used by Effie and her daughters. Despite many rumors, Effie is still making jewelry and her work is in demand world wide. Check out the other beautiful Effie Jewelry in our Products section under "Jewelry". Or use our Search page and type in effie, search now.